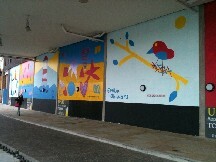 Kerseys’ panel for the Never Ending Mural is now up on the Waterfront. You can find it from Stoke Bridge end, going under the walkway from the Dance East building. It shows a very stylish nesting bird and was inspired by a drawing from our workshop by Emilia Chilvers aged 7. Do take a look and come fly with Kerseys! 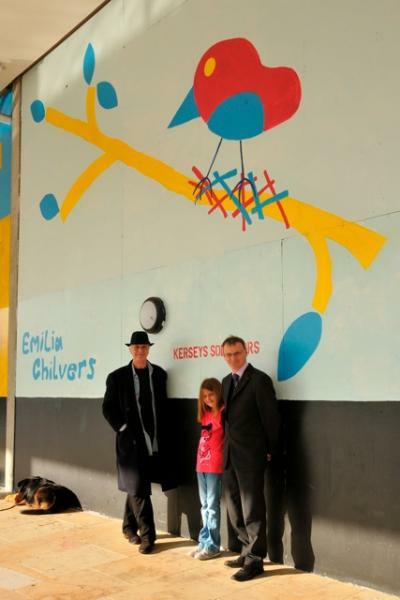 John D. Edwards, Emilia Chilvers and Anthony Wooding in front of Kerseys’ panel. Additional photograph of John D. Edwards, Emilia Chilvers and Anthony Wooding in front of Kerseys’ panel.